El Yunque National Forest adds a beautiful day of adventure to your Puerto Rico vacation. It’s a must see! 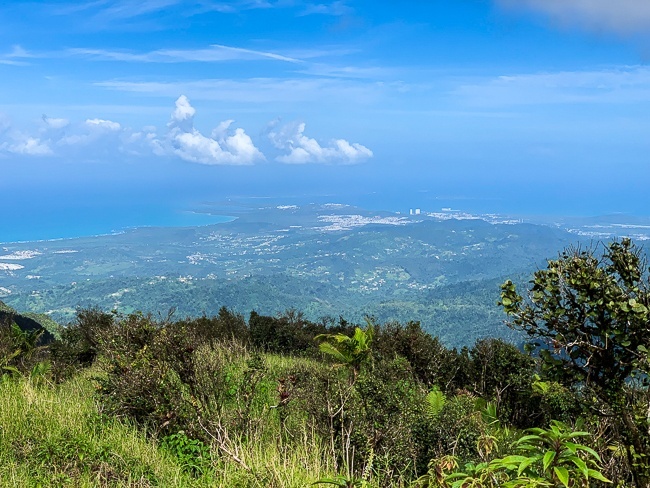 But, the El Yunque area was hit hard by Hurricane Maria which may have you wondering, like I did, what parts of the rainforest have reopened to travelers and hikers so you can plan out the best day in the rainforest. 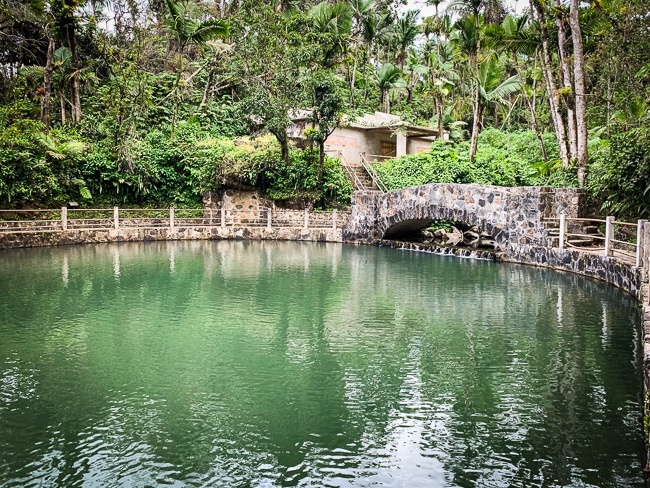 In this guide, you’ll find information about the layout of El Yunque, what waterfalls and hiking trails were opened and closed as of my March 2019 visit, what to do in the rainforest, and your best options for getting to and from the park. El Yunque experienced significant damage from Hurricane Maria, in particular, and repair work will continue for quite some time. What’s amazing to see is how resilient nature is! Throughout the park, you can see how the landscape is healing itself. During this time of repair and regeneration, roads and some trails may close at the last minute for a variety of reasons. I’d advise checking USDA/El Yunque National Forest for updates and alerts before your visit to the El Yunque rainforest. With that said, I had an amazing day hiking in El Yunque following the ranger’s advice and the most up-to-date map available and so can you. 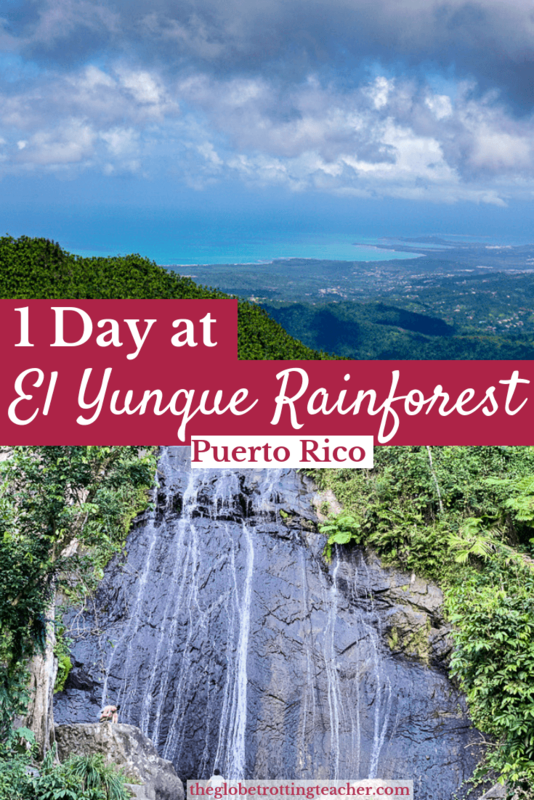 What is El Yunque Rainforest? Located in northeastern Puerto Rico, El Yunque is the largest Puerto Rico rainforest, as well as the only rainforest in the United States National Forest system. 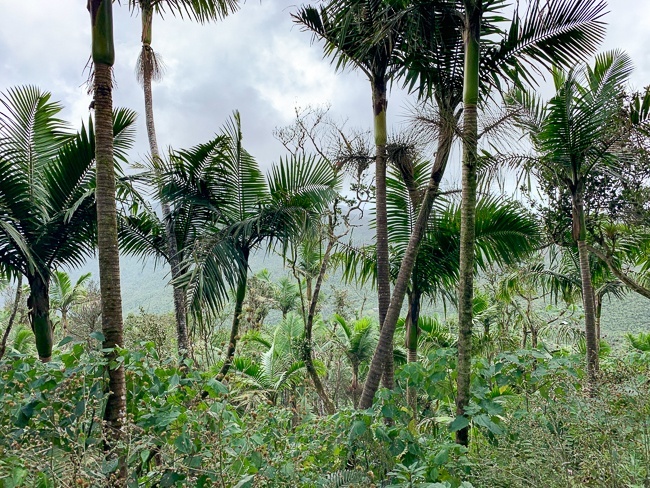 It was formerly known as the Caribbean National Forest until its name was changed to El Yunque, after one of the island’s Native spirits, in 2007. 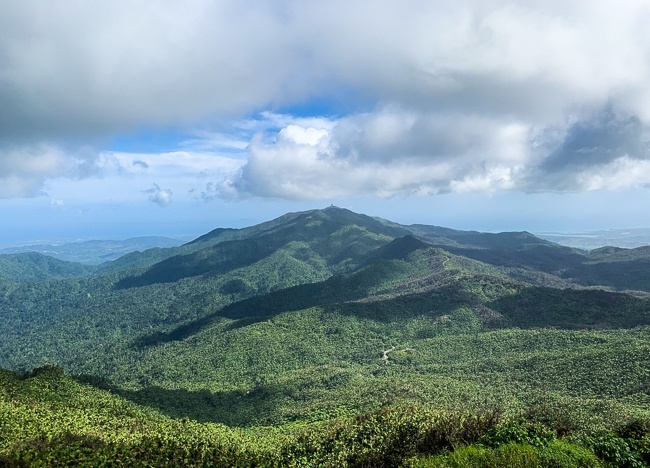 At 28,000 acres, El Yunque National Forest is relatively small for a National Forest but it’s a lush and diverse natural space that immerses you into the rainforest ecosystem. El Yunque is home to thousands of native plants and trees, with nearly two dozen tree species exclusively found in this forest. There are no large animals in El Yunque but it’s home to hundreds of smaller ones like birds, bats, and lizards. Of all the El Yunque animals, several can only be found here, including the Puerto Rican Parrot and the tiny tree frogs called coquis. No matter what time of year you’re visiting El Yunque National Forest, expect the climate to be fairly consistent all year round. In the summer, the average high temperature is 80° F with a low of 68°. In the winter, the average high temp is 72° with a low of 58°. El Yunque gets over 200 inches of rain a year. With all that rain, you’d expect to have a mosquito issue but I did not encounter one after a full day of hiking. Be prepared, though, for wet trails. Along with a day on Culebra, hiking and swimming in El Yunque is one of the most popular Puerto Rico day trips. 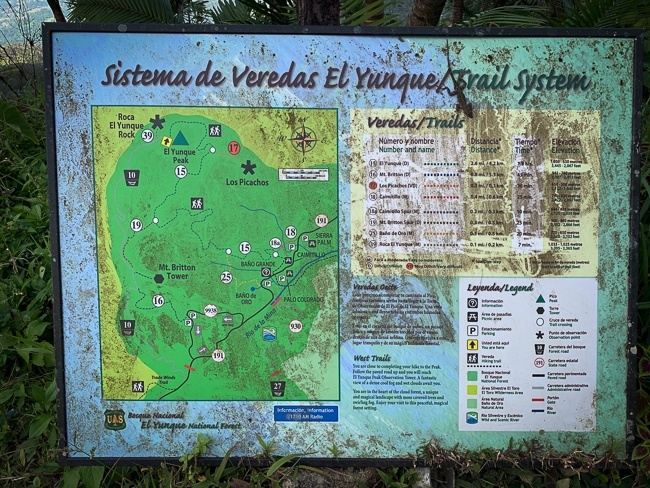 In the park, you might also find a map of El Yunque national forest but a paper map from the ranger is best. First, it’s important to know, the El Portal Rain Forest Center is CLOSED. This was the main El Yunque Visitors Center before Hurricane Maria did significant damage and shut this facility down. Extensive work is in progress now and it’s targeted to reopen at the end of 2019. The current visitor center is now in a short term place just outside of the National Forest called Portalito HUB in a little town called Palmer. It’s at the base of El Yunque. Unaware of the above, I plugged in El Yunque Visitor Center in my Waze app and it put me on this narrow street in the middle of this sleepy town. Not exactly sure where I was, I parked on the street and eventually found my way to this temporary space. You can type into the app El Yunque, but select the option for Portalito HUB to find the exact location. Here you can get a map, some souvenirs, bottles of water, a poncho, and use the bathroom. There are employees here to help with any questions and update you on the latest El Yunque information. If you decide to drive straight into the park, you won’t find a visitors center. Instead, you’re likely to see Park Staff directing you to a pull off and passing out a current El Yunque National Forest map, as well as answering any of your questions about what’s open and closed. Trails can be narrow. Small groups are best. Tours range from half-day to full-day hiking tours and typically include taking a dip in an El Yunque waterfall. The full-day tours can usually be booked as a combo tour with a bio bay kayak tour outside the park for later that evening. 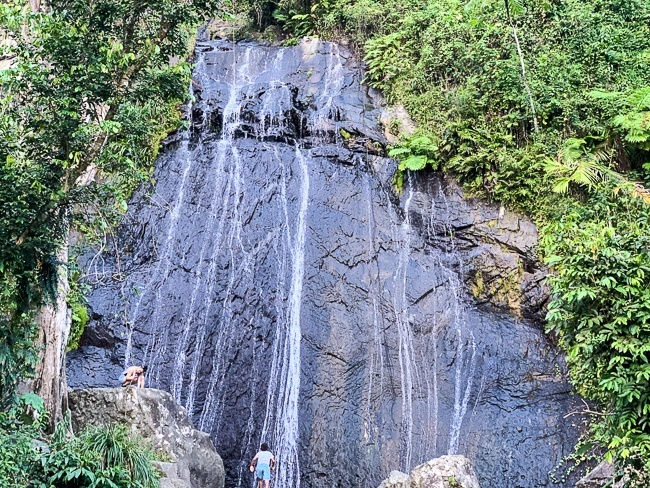 You can also book an El Yunque zipline adventure located at the edge of the forest which typically includes a swim in a natural pool, as well. Or choose a tour take takes you off-the-beaten-path in El Yunque to discover a different side of the park. With a rental car, though, you can experience the best of El Yunque at your own pace. This is obviously ideal. You can also adjust your day at the National Forest depending on the most current information about open and closed areas of the park. However, I’d have gladly chosen an El Yunque rainforest tour if I didn’t have a rental car rather than miss out on visiting such a beautiful natural place! The ecosystem of the National Forest creates a lot of moisture which journeys downhill, eventually plunging into the park’s waterfalls and filling natural swimming holes in the process. Nowhere are the waterfalls in Puerto Rico more beautiful than the ones you’ll see in the National Forest. El Yunque has three waterfalls and they’re all fairly accessible as you travel on the main road, PR 191. This was the most popular waterfall to see but the trail is currently closed to the public. It’s not expected to reopen until 2021. Prior to its closure, La Mina saw a ton of visitors on most days, not only because of the beauty of the waterfall but also because you could take a dip in the waterfall’s pool. When La Mina eventually re-opens to the public, it’s about a 45-minute hike that descends for .7 miles before reaching the falls. This waterfall is the easiest to see because of its location right off the main road, PR-151, about 8 km. from the park’s entrance. There’s a pull off area just across from the waterfall. If it’s busy, you’ll have to find another spot to pull off and walk back to the falls. You won’t see parking lots but cars can pull-over just off the road. These spots fill up quickly, though, so you may have to drive up the road a bit before finding an open spot. Be mindful of the “No Parking” signs. Park Rangers are making the rounds so I wouldn’t park in a restricted area….as tempting as that might be. Plus, these restricted zones tend to be in blind curves or tighter spots on the road. You don’t want to be dealing with damage to your rental. Not far from La Coca falls, you can hike to Juan Diego Creek. It was marked at 9.6 km on the map but I drove right past it because the sign marking the trailhead is down. Once I got my bearings, I found the trailhead but it was temporarily closed on the day of my visit. 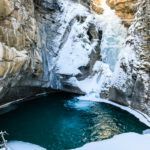 If open, it’s an easy hike to the first set of waterfalls and swimming holes to jump in. It can get crowded here since most El Yunque tour groups tend to stop here. If you can, make this your morning stop and continue going up the trail to more secluded falls and swimming holes. Expect the footing to be wet, muddy, and slippery on rocks. It was a bummer to miss out on the swimming holes, but in the end, the El Yunque hiking trails that take you up to the Mt. 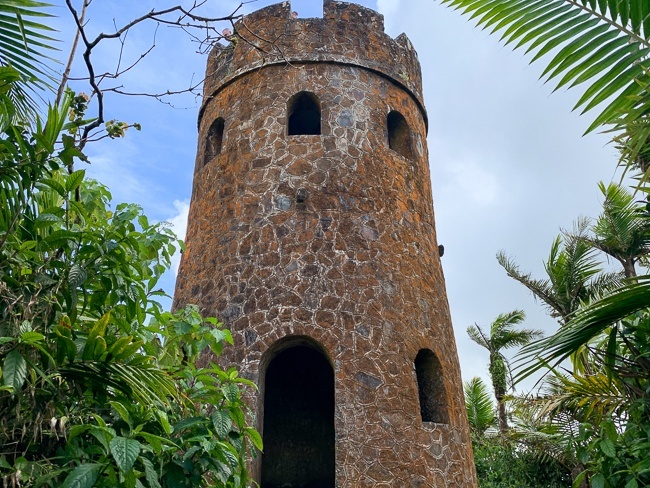 Britton Tower & El Yunque Peaks are fantastic hikes with views that really pay off. Not a waterfall, but a large natural pool just an easy walk from the main road. You can walk around Bano Grande which includes a stone bridge that acts as an observation point to view the water. It’s further up the road past Juan Diego Creek and La Mina Falls, on the way to the Mt. Britton trailhead. A stop here should take no more than 10 minutes. El Yunque has the best hiking in Puerto Rico! 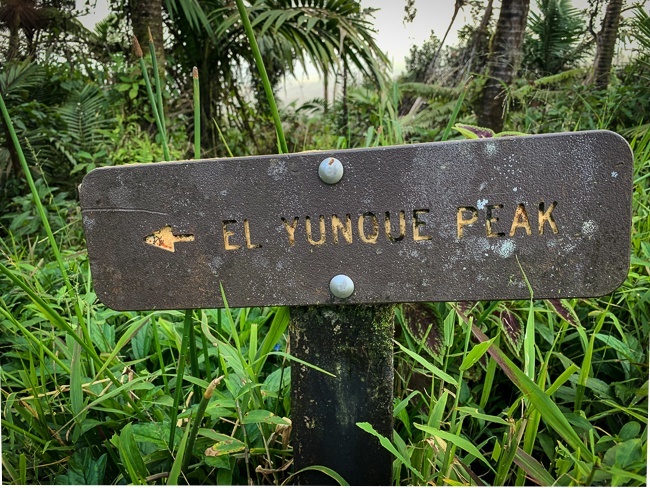 Plan to dedicate a full day if you’re interested in hiking a few of the trails, especially the one that takes you up to the El Yunque Peak. No matter which trail(s) you choose, wear sturdy hiking shoes! Given El Yunque’s cool and damp climate, it’s also not a bad idea to pack a poncho, especially if you’re carrying a camera or other things in your daypack that shouldn’t get wet. 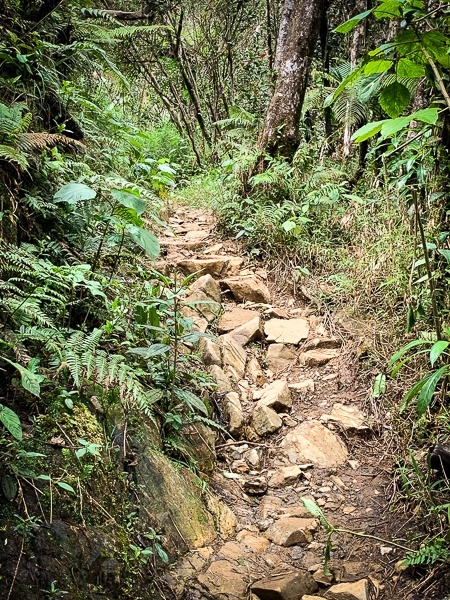 La Coca Trail is a challenging trail that begins just across from La Coca Falls. it. 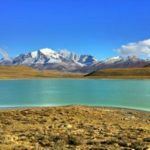 It’s at least 1.5 hours one- way but most hikes on this trail will take about 4 hours for a round trip. The hike is steep and muddy with several stream crossings. The pay off comes at the end where sometimes you can jump into a natural swimming hole. My advice is to ask the Park Ranger about the water flow to that natural swimming hole. If there hasn’t been enough run-off into the natural pool, you’ll miss out on the trail’s reward. 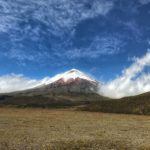 Hearing the pool at the end of La Coca trail wasn’t full, I chose instead to head up to the highest peaks in the forest. I didn’t want to pass on the panoramic views. I headed up the Mt. Britton trail, which is a one-way loop that ascends to the Mt. Britton Tower. It’s a fairly steep climb along a narrow trail for about 1 mile. To this point, the hike should take roughly 45 minutes one-way to the tower. Once you reach the tower, it’s a short trip up a narrow flight of stairs to the top of the tower. 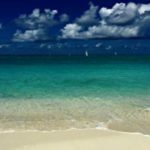 The tower offers sweeping views of the Atlantic Ocean and the Caribbean Sea. 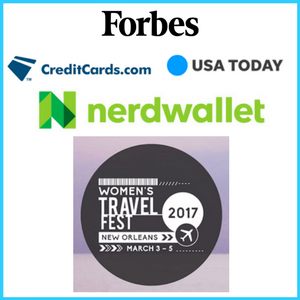 You won’t want to miss seeing these views for yourself! Once you’ve completed the Mt. 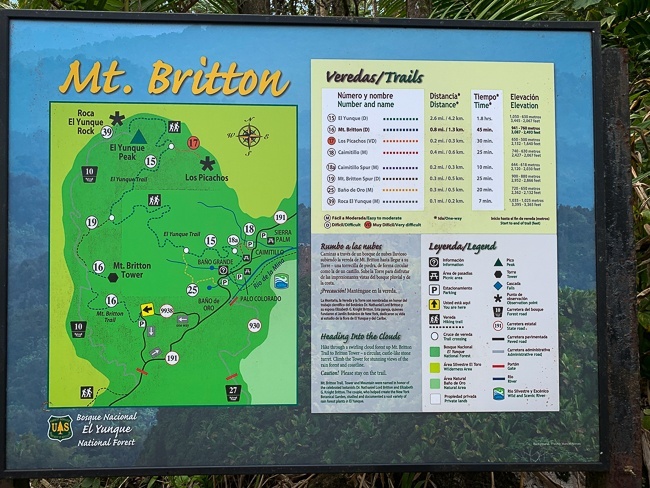 Britton trail, you can head down from the tower and walk towards the Mt Britton Spur which takes you to the trailhead for El Yunque Peak, the highest peak in the forest. 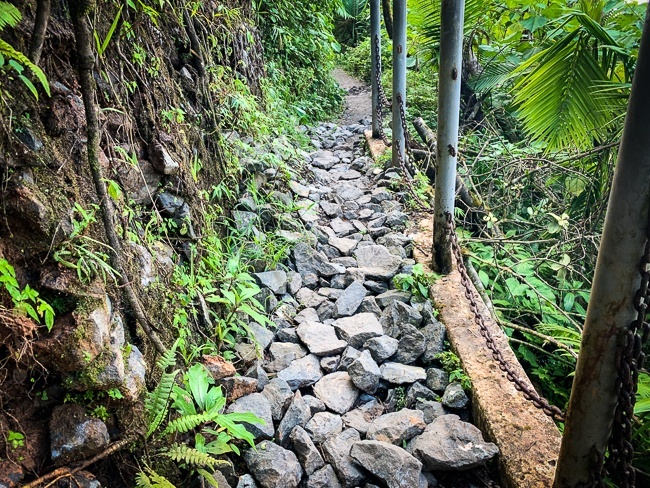 This section of the hike to El Yunque Peak should take about an hour one-way. 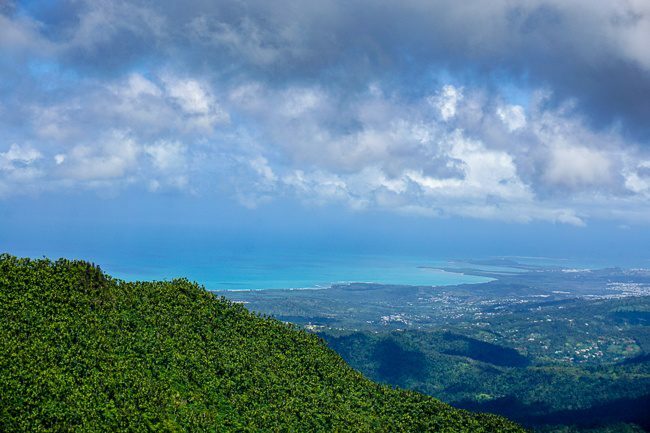 El Yunque Peak has stunning views of the water but you can also take in the entire National Forest including Mt. Britton Tower from a distance. 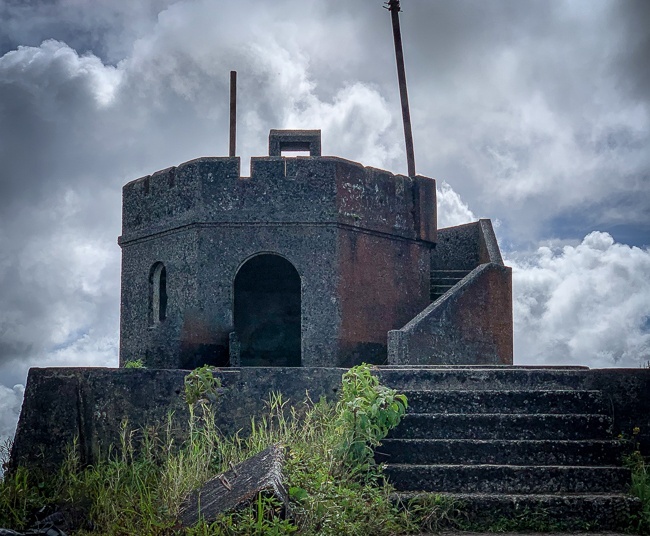 The peak is one of the highest in Puerto Rico, standing at just over 3500 feet above sea level. You’ll see a viewing tower with a platform to take 360° view photos. If you’re up at the peak long enough, especially in the afternoon, expect to encounter a weather system passing through with clouds, mist, and a cool blast of air in between the bursts of sunshine. Getting to and from El Yunque is easy to do with a rental car. I highly recommend using the Waze app for navigation. Driving in Puerto Rico is not all that complicated but if you have no clue where you’re going it makes for a frustrating start to the day. Waze put me right where I needed to be. From your San Juan hotel, the ride should take about 45 minutes. Depending on when you’re planning to drive over it could take a bit longer because of traffic. 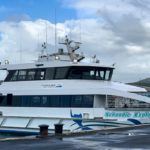 On weekday mornings, expect to find some commuter traffic, especially around the San Juan area. Plus, there’s still plenty of road work going on either because of repairs from hurricane damage or general road maintenance. 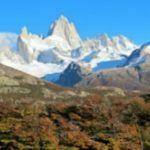 A few words about using Uber to get to the National Forest. Don’t do it. 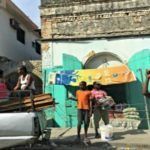 Uber was readily available and affordable in and around the San Juan area. It’s possible a driver will offer to drive you just outside of El Yunque, which will require an uphill walk into the park. The bigger problem is the return journey, however. Cell phone signals are weaker in the forest and, technically, Uber drivers aren’t allowed to enter the park for pick-ups. Reports online tell of travelers who were stuck or saw others in this predicament and offered to help them when they couldn’t contact the driver who offered to pick them up. If you don’t have a rental car, it’s safer to opt for one of the many El Yunque rainforest tours instead. Your Puerto Rico trip isn’t complete without a day exploring Puerto Rico’s only National Park, El Yunque! You’ll be glad you took the time to explore this lush tropical corner of the island. 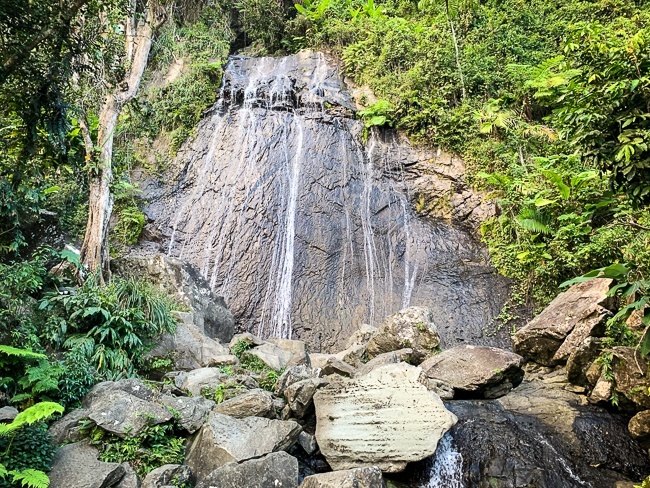 Are you planning a visit to El Yunque National Forest?